The community with faithful prayer and fraternal affection is close to the Coptic Orthodox Church for the death of His Holiness Patriarch Shenuda III, one of the great church personalities of our times, who passed away on 17 March at the age of eighty-eight. He was elected in 1971 as the 117th successor of St Mark the Evangelist in the see of Alexandria. In 1973 together with Pope Paul VI he signed a common declaration of faith in he incarnation of the Son of God, thus inaugurating a new season of fraternal contacts, within the framework of his untiring search of church unity and inter-religious dialogue. Br Enzo and those of us who knew him and were honored by his faithful friendship remember the man of profound and ardent faith, capable of bearing even exile for its sake, a spiritual man of great passion, humanity, and deep goodness towards all. He gave hours of his time to listen to individuals in need and with infinite patience responded for hours to the most varied questions of his faithful during the traditional weekly meetings at which thousands of persons participated. He longed for peace and brotherhood. 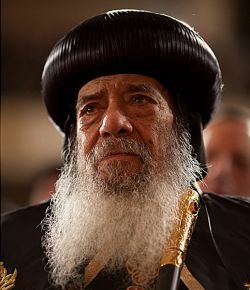 “Modesty is the best way of following Christ,” he used to repeat and, thinking of his people, “Egypt is not a land in which we live, it is a land that lives within us.” We are certain of his efficacious intercession in heaven for the Coptic Church and for the Egyptian people, for all Christians and for all men. In particular, our prayer accompanies our beloved Coptic brethren and those who will be called upon to elect the new patriarch, tat the Spirit may grant them light and discernment.